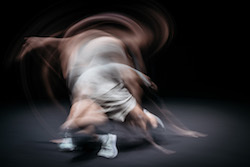 Kristina Chan’s A Faint Existence originally premiered in 2016, and is now performed as part of UnWrapped, a new series presented by the Sydney Opera House to showcase contemporary works. Kristina Chan’s ‘A Faint Existence’ at the Sydney Opera House. Photo by Daniel Boud. A Faint Existenceexamines Chan’s sense of frustrated futility and responsibility when faced with global warming and climate change, as well as meditating on fragility and mortality. In some ways, perhaps it could be viewed as a female counterpart to Meryl Tankard’s The Oracle as performed by Paul White, and is linked to Chan’s other solo Mountain. A Faint Existence opens with Chan, casually dressed in a grey sleeveless top, shorts and socks and sneakers, repeatedly rising and falling on demi-pointe en place, like a shaman summoning the creative spirit. Her choreography demands enormous control and a very flexible back, as well as apparently boneless shape shifting arms. You can also see a possible Butoh influence and that of Bangarra perhaps at various points. With her elegant elemental twisted shapes in space, Chan becomes a mysterious primordial creature, sometimes tree-ish, sometimes bird-like with broken wings for arms, at other points a stealthy forest creature with hands as paws, or an underwater inhabitant. Chan is powerful, magnetic and compelling. At times, her performance is almost trancelike. Sometimes, it is as if she is caught in a vertical box, but there is also slithery floorwork. There are sections of stillness and others of repeated phrases of movement. Is she battling unseen destructive forces? Benjamin Cisterne’s evocative dramatic lighting ranges from the hints of a sunrise to an eclipse to a starry sky and other atmospheric effects. Clare Britton’s set consists mostly of a large disk in the middle of the stage – the Earth viewed from space – and a billowing banner stretched between two poles visible at certain points during the performance. The relentlessly driven rhythms of the soundscape by James Brown are full of pops, crackles, beeps, humms, a ticking alarm clock, a heartbeat, as well as a rather overwhelming throbbing low bass at one point, all contrasted with sections of intense silence where the audience hardly dared to breathe. A Faint Existence is a most striking, compelling piece.